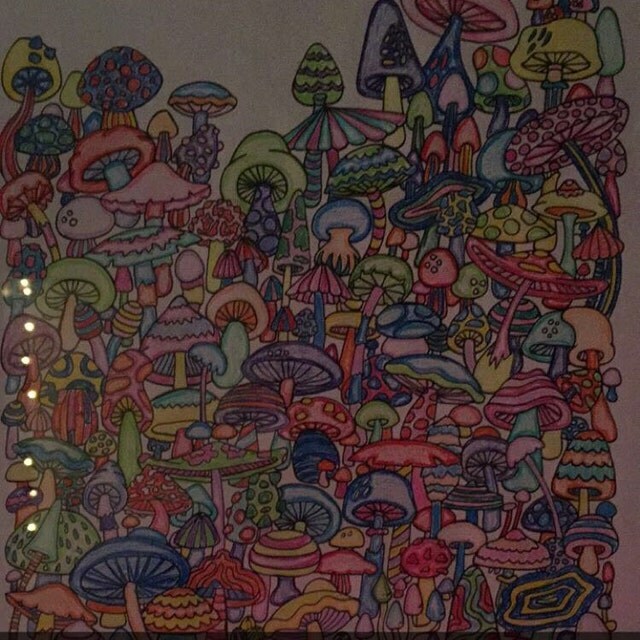 A mushroom coloring page to hilight the beautiful variety in nature. No two mushrooms in this widely varying smorgasbord are exactly alike. You could color this using psychedelic rainbow colors, or natural earthy tones, or a combination! “Mushrooms” is one of the ten pages in the “Hippie Kitsch” coloring book. Categories: Coloring Pages, Hand Drawn. Tags: book: Hippie Kitsch, Candy's Faves, Hippie Coloring Pages, Mushroom Coloring Pages, Nature Coloring Pages, Popular on Etsy. Upon purchase, you’ll be able to instantly download this single coloring page as a watermark-free PDF and print to color it as many times as you please. The PDF is sized for an 8.5×11-inch page with half-inch margins. It can also be printed on A4 paper without issue. This coloring page was hand drawn in pencil and ink by Candy Hippie, then scanned and digitally retouched to create a perfectly clean and professional image with no smudges, sketch lines or other unwanted marks. You can also find this mushroom coloring page in the Candy Hippie Etsy shop.